Our volunteers are truly at the heart of The Haven and help us impact more lives every day. You can volunteer from anywhere, even online. Perfect for individuals and group volunteer projects alike. We are confident that we can find a good fit for you! • Do you have an eye for design? Help us in our Upscale Resale store! • Retired professionals are always on demand to help in our programs for employment readiness. • The young at heart enjoy working with children and teens at Selby Preschool and Haven Academy. Short on Time but Not on Heart? 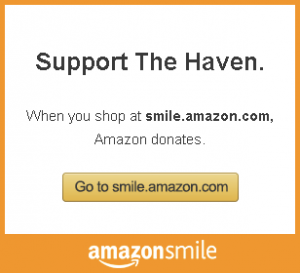 Did you know that one of the best ways to raise awareness for The Haven is through conversations with family, friends, coworkers and others in your community? It’s amazing how much a short conversation can impact someone’s life. What you can do to help is limitless! However you choose to volunteer, it all adds up to a big difference for the people we serve.